Looking for Things to Do in Dublin? Whiskey, Beer, and Sights are Here! Thinking about heading to Dublin? That’s a really good idea! There are plenty of amazing things to do in Dublin from checking out historic sights to drinking and more drinking! In all seriousness, while the city is certainly known for a few alcohol-centered activities, the city is full of history, great nightlife, romantic things to do, and offbeat culture around each corner. Eric would know – he visited Dublin twice in the past few years. Once as a “novice” Europe traveller and the other time years later ON St. Patrick’s Day. Yes, the city centre was absolutely wild at night. One pub crawl, a few tours, and a few laughs later, Dublin has always been a place he wants to return to with Lisa (since she’s never been). So, if you’re ready, let’s explore Dublin! Ireland Travel Tips – Places to Visit Told By Fellow Travel Bloggers! From general information to how to get around the city, here is a short section on a few important things that you should know when you are planning a trip to Dublin! With a population of over 500,000 people, Dublin is the biggest city and capital of Ireland. Dublin is located on the east coast of the island – right at the mouth of the River Liffey. The river bisects the city – splitting it into a north and south halves. While we’re here, it’s probably a good time to remind everyone that Dublin is the capital of the Republic of Ireland. The world usually just says “I’m heading to Ireland” and they know it’s The Republic of Ireland. This is different from Northern Ireland – which is part of the United Kingdom. Northern Ireland is on the same island as “Ireland” but its capital is Belfast – just so we’re clear! Ireland is in the EU, and as such, has adopted the Euro. So you will need to have some Euro cash or coins on hand for bus fares and/or small transactions. Cards are accepted but don’t always count on that in Europe (Eric speaking from experience in the Netherlands not accepting Visa Credit Cards). As for visas to visit, Ireland is in Europe and the European Union but NOT the Schengen Area. The Schengen is that “borderless” area around most of continental Europe that once you enter you can travel around freely for up to a certain amount of days. Well, Ireland is not in that. So, while most passports (Canadian, American, etc) can enter Ireland visa-free as a tourist for up to 90 days, other passports might need a visa to enter Ireland. There we recommend that yu check with your country’s embassy website for up-to-date information. Dublin is geographically close to North America and so you might consider booking a stopover flight in Dublin on your way to Europe! That said, Dublin Airport is the main hub to go in and out of located just to the north of the city centre. Eric has flown through a few times and it’s a nice airport. He actually missed a flight out of there once but that’s a story for another time! To get from the airport to the city centre (not by taxi) you can take the Airlink – a similar bus service like in Edinburgh. It’s a foolproof option for getting into the city for a reasonable price and service. You can buy it when you land but generally the lines are long so consider buying your Airlink ticket to the Dublin city centre beforehand. Dublin is a pretty car-friendly city but, as we will mention below, it’s also very walkable. Since Dublin is such a major centre in the country, it is often used as the fly-in or out point for any Ireland trip itinerary. This makes it a prime city for picking up or dropping off rental cars. On that note, Ireland is very driveable and a road trip is a great option to get out of the city to make day trips or to tour the island! If that’s your plan, you’ll find all the big car rental companies you know and trust plus a few Euro specific ones. You can use this handy tool for comparing rental car prices in Ireland! Like we said above, Dublin is a pretty flat and walkable city – just watch the cobblestone roads at time. Things are pretty close together so you won’t have too big a problem navigating – not like trying to get across London. Another way you can easily get around Dublin is by renting a bike! Biking around the city would be “doing it as the locals do”. You can definitely take public transportation (in the form of buses) to get around. There are also trains and trams that connect the city centre to the outskirt areas and along the coast further away from the city. You can check out the public transport website for more details, including maps, fares. However – there’s a great option available for travellers. If you purchase the DoDublin Card, it includes your Airlink ticket to and from the airport, AND bus transport on public buses, the hop-on/hop-off tour bus and discounts on attractions for 72 hours. So, that’s super handy if you don’t want to walk the entire time. It might be perfect if you are doing an Ireland trip and starting in Dublin for a few days – so check out the DoDublin Card cause it’s actually good value for money. You’d be hard pressed to find a city pass that is THAT comprehensive. This is the bar connected to the hostel where Eric stayed – pretty lively! As with most major cities, Dublin has a huge mix of nice and budget hotels, lots of hostels as a popular backpacker city, and private accommodations. Many of them are concentrated in the city centre both north and mainly south of the Liffey. From upscale hotels to budget friend options, you can begin your search for hotels in Dublin here. 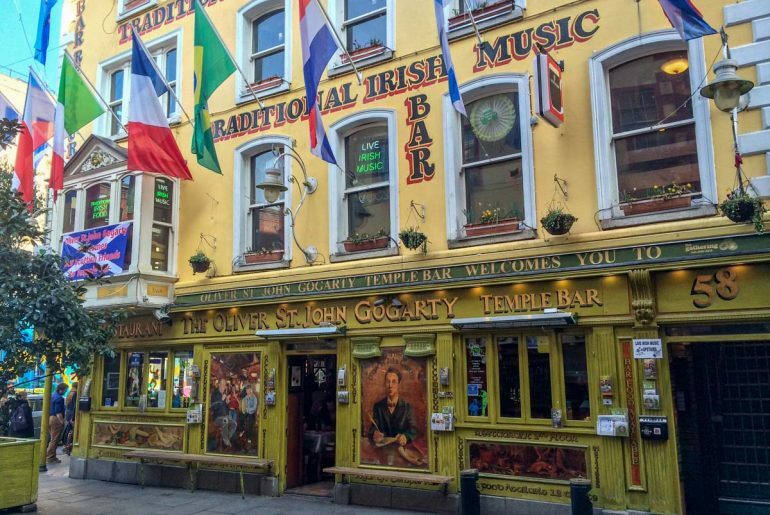 If you want hostels, Eric stayed in Oliver St John Gogarty’s Hostel and really liked it. In fact, it even made our massive list of favourite hostels we’ve stayed at in Europe. The area – Temple Bar – is very lively and loud so if that’s what you are looking for, go for it. The place was cheaper than other hostels but still safe and secure, nice staff, and a decent sleep. You can always search for other hostels in Dublin here if that one doesn’t suit you! There are LOTS to choose from since Dublin is so popular. Okay – the part you’ve been anxiously waiting for, right? These are in no particular order. If you’re keen to book a guided tour or there’s an attraction you know you want to check out, you can get started looking at activities in Dublin! Dublin is a very interesting city. Yeah, you can say that about literally every other city on the planet but we mean it. Dublin has sat at the crossroads of significant history so many times it’s often hard to keep track. Luckily, you’ve got people that are paid tell you stories about these things! In all seriousness, Dublin is this unique mix of culture, arts, history, architecture, nightlife – all rolled into one tiny package. Dublin isn’t a huge city but it packs a punch for any visitor. As such, there are simply a ton of tours – for all different interests on all different methods of transportation that you can hop on! For a classic walking tour of the sights and history, check out a Classic Sights and Highlights Tour. For the classic bus tour of many of the same places, Dublin’s Hop-on/Hop-Off bus tour is a great option. To learn about Dublin’s dark past, a ride on the GhostBus Tour might be for you! If you are into literature and learning about famous Irish writers, a Literary Walking Tour will take you back through time. Finally, relive Ireland’s struggle for independence through a Historical Dublin Walking Tour! 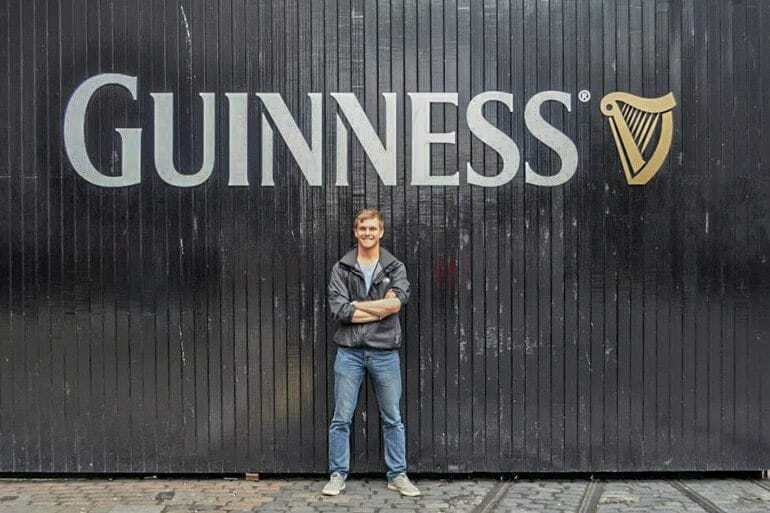 Eric – circa 2013 – checking out the Guinness Storehouse! Arguably one of the most famous attractions in all of Dublin (and Ireland), the Guinness Storehouse is something you’ve probably heard of! Considering how famous the beer, the brand, and the backstory are, it’s no wonder they’ve put together such an amazing tour experience! Eric did the experience back in 2013 and loved every second – mainly because he’s a Guinness drinker himself! During the standard self-guided tour, you get to learn all about how Guinness is made, the story of Guinness, and the brand itself. From old advertisements to pouring your own pint, there are definitely a few must-do and see photo experiences in there! The best part of the tour is the finish. You work your way upward to Gravity Bar. At the top, the 360 degrees glass bar on top of the storehouse gives you views of the entire city. The best part? You get to claim your free pint of Guinness poured fresh right there! Enjoying the Dublin cityscape with a Guinness in hand is definitely worth the money and the experience. They really have done a great job with it, in our opinion! You can learn more about the Guinness Storehouse here and book a Guinness Tour Ticket in advance here. You should DEFINITELY book in advance since the place can get busy and slots do fill up in advance! If you are big into art, you’ll want to check out the National Gallery in Ireland! It is home to some of the most important Irish artworks (plus lots of other European ones). The Gallery is conveniently located in the centre of Dublin so it’s easy to reach and the general collection is free to enter. So there’s really no reason not to stop by and admire a little art! Learn more about the National Gallery at their website. To learn more about Ireland’s darker side of history, you can tour Kilmainham Gaol Prison. The former prison was built in 1796 and lots of Irish revolutionaries were kept there (and killed) because of their resistance to British rule in Ireland after 1916. Inmates were treated very harshly and even women and children were held there for minor crimes. These days the prison is a museum where you can go on a tour to learn all about it. During the course of the 45 minutes to hour long tour, you will learn all about the history of the prison and its role in Irish history by touring through places like the cells and the courtyard. Since the prison is a popular spot in Dublin, it’s a wise idea to book tickets in advance for the tours. You can do so on the official website. The prison is approx. 3.5 km from city centre so take the bus # 13 or 40 from O’Connell Street to get there! This one was originally recommended by Eion from Dollys Quest in our best things to do in Ireland post. We agree that it is a unique thing to do in Dublin that’s why you can find it on this list as well! The cemetery is one of the most important historical locations in Ireland since it was actually the first Catholic cemetery in Ireland (opened in 1832). You can do a tour during which you can wander through some of the graveyards where famous political figures, poets, writers etc. have been buried and hear more about their story. In the museum, you’ll learn all about why the cemetery is so important and how it was developed. It’s located approx. 3 km from the Dublin city center so can either walk or take buses 40 or 140 from O’Connell Street but also keep in mind that Glasnevin Cemetery is something that the Dublin Hop-On Hop-Off Bus regularly visits! You can learn more at the official website. One of the MANY pubs or bars in the Temple Bar area of Dublin! There’s no denying the fact that if you are a tourist in Dublin you need to visit the Temple Bar area! As a go-to place for classic nightlife for tourists, you almost have to go just so you can say you’ve been at least once after dark. Temple Bar is actually the name of both the highly concentrated area of pubs as well as the name of a famous bar located inside the area of Temple Bar. Temple Bar, the pub, is one of the most famous bars in all of Dublin. You’ll find beer, whiskey, live music, and a whole lot of people! Here is the link to the website for the bar to check it out when you visit. If you wanted to head out on a pub crawl to really maximize the night and the experience, check out the traditional music pub crawl led by musicians. There’s also a literary pub crawl for those interested in Irish literature-based performances and having a few drinks at the same time! The National Museum of Ireland is one of the best free museums in the city. This makes it a great activity – and even more so for a rainy day! The museum was originally founded in 1877. Today, there are actually four different locations: one for archaeology, one from decorative arts & history, one for country life, and one for natural history. Three of them (minus country life) are located in Dublin. If you want to learn more about which museums are where check out more information on the website. The museums have lots of different events and exhibitions. As with rotating events/exhibitions you are bound to find something that interests you so check the website frequently if you are heading to Dublin. The best part is that you don’t have to pay for entry. Hours are Tuesday-Saturday until 5 pm, and also Sunday but only for a few hours (from 2 – 5 pm). They are closed on Mondays so be aware of that! Established in 1592, Trinity College Dublin is one of the most important colleges in the country. Over the years, there have been a number of famous graduates – like Oscar Wilde. As a visitor, you are allowed to walk through campus and admire the buildings. One highlight is certainly the library since the Trinity College Library is the largest library in Ireland. Unfortunately, the main library is only open to students/staff of the College but visitors can have a look at the Old Library which is open to visitors. In the Old Library, the highlight is the so-called “Long Room” which was built in the first half of the 18th century and is home to the 200,000 oldest books in the collection of the library. In fact, many people come to see the Book of Kells – a Latin book containing gospels of the New Testament. For more info on visiting and opening hours, you can visit the website and get a ticket for the Book of Kells here. The library is open until 5 pm most days (and 4:30 on Sundays from Oct-April) so go during the first half of the day if you can. St. Patrick’s Cathedral is the largest church in Ireland. Founded in 1191, it also makes it one of the oldest! Even for European standards, Lisa considers that to be old! As a result, the church has been a central part of the city for centuries. There are lots of visitors every year and the building is used for important celebrations such as Remembrance Day. It’s not free to enter (currently 7 Euro for adults) but it is worth it if you are interested in churches in general. Once you are in, you can participate in a free guided tour through the church or rent an audio guide to learn more about what you see in front of you. You can check out the official website here and also book your self-guided admission ticket in here. Located in Glasnevin, the National Botanic Gardens are the perfect place to take a break from the busy city. In the gardens, you’ll find a beautiful and tranquil green space north of the city. There is actually another garden in Kilmacurragh that is also known as the National Botanic Gardens. The plants there are very different but the two places are closely linked! The Gardens are open every day, and you can go for a walk or just sit down and relax. Depending on the time of year, they have some beautiful flowers and other plants in the gardens that you might catch in full bloom! The Dublin Gardens have restored glass houses that hold many plants. The set up makes this Garden a top place for scientific research in botany! Oh, and if you want a guided tour to learn more about the Gardens, it is possible. You can find more information about the tours and the Gardens here – but spoiler alert – tours are FREE on Sundays! The front entrance to the Jameson Distillery is a sight that any whiskey lover can love! If you’re Ireland, you’ve got to sample some Irish whiskey. 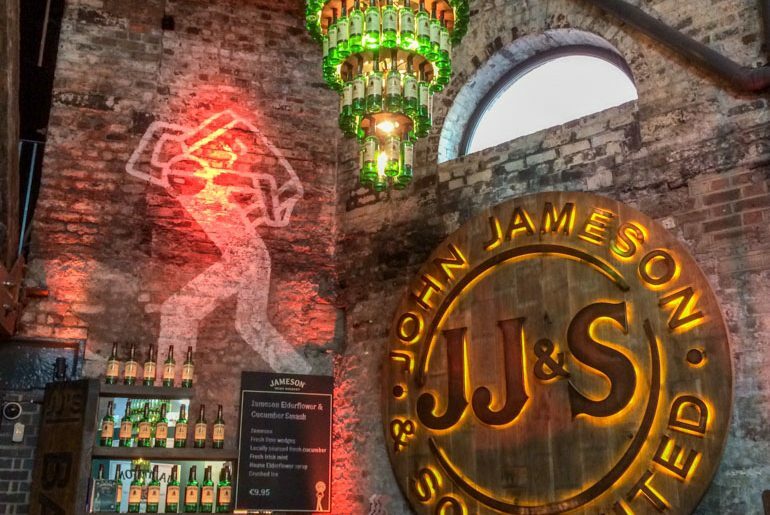 Now, there might be no better place to do so than at the Jameson Distillery! Full Disclosure: Eric loves whiskey and Jameson is actually his favourite whiskey, honestly! Located off Smithfield Square north of the river is where you’ll find the facility. Originally Jameson whiskey was produced and distilled there until about the 1970s. These days, the facility is used more for showing eager tour-goers how the magic happens. On the tour, you will learn about the creation of whiskey and do a whiskey tasting. The guided tour itself is fantastic. Eric did it back in 2015 and really enjoyed it. After learning all about the history and the process of making whiskey (and, of course, specifically Jameson) you get to sample Jameson and a few other whiskeys produced in other countries to compare and contrast the differences. The guide does a great job of walking through what you are doing to make sure you learn as much as you can about whiskey! Of course, you don’t HAVE to drink if you don’t like. There is plenty of fascinating backstories to the brand! At the end, before the gift shop (with really cool gifts, we might add) you end up in the bar where a free drink awaits – and you can buy another if you wish! Lisa doesn’t really know about the creation of whiskey so this is probably a tour we should go on! You can learn more about the brand at the official website. Pro Tip: Book your Jameson Tour in advance to get the day and time you desire! Just in case you haven’t had enough of whiskey or drinks in general yet, there is an Irish Whiskey Museum which you can visit as well! The museum is great – you get to learn about different kinds of Irish whiskey (not just Jameson as during the Jameson Distillery tour). The museum also offers an interactive tour – and of course, interactive for whiskey means sampling it. You can book your tour and tasting experience at the Irish Whiskey Museum here. Did the photo make you laugh? We laughed! Okay, it actually won’t be difficult to spot the Spire in the centre of O’Connell Street. This is because it’s approx. 120 metres tall and has a 3 metre diameter at its base! Interestingly enough, the tip is only 15 cm in diameter at the top! 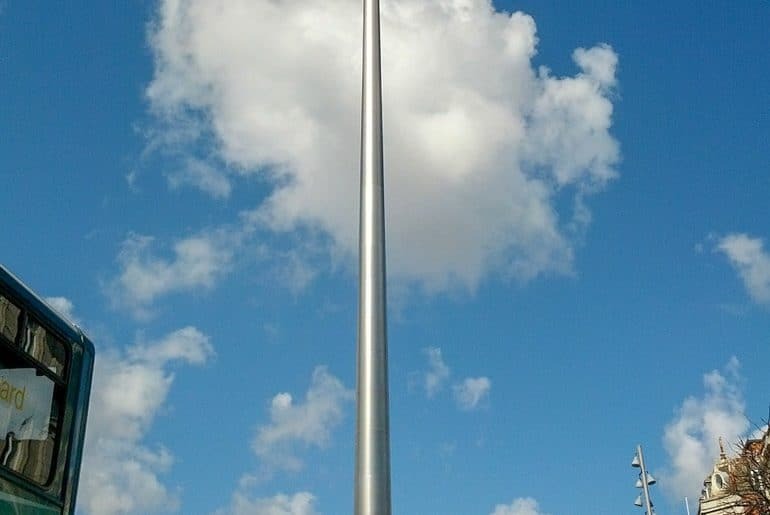 Talk about a giant stainless steel needle! The tip of the Spire is lit up during the night – and this is helpful in case you get lost (not that we hope that this will happen). If you ask locals, some people love it and some hate it so go and see for yourself! And then we have Dublin Castle! Built in the early 13th century, it was used as a headquarters for the English officials and British administrators in Ireland. The Castle was handed over to Irish government after independence in 1922! Today, sitting proudly in the middle of the city on 11 acres, the Castle is both a tourist attraction and a government complex. You can do either a self-guided or guided tour of the grounds and inside of the Castle (which includes quite a few different museums). If you do a self-guided tour, you get to see a little less than with a guide since not everything is open for everyone to explore on their own. You can book your tour for Dublin Castle here. Pro Tip: Sometimes, the Castle has special events on that you can book a ticket to. Check out the special events section of the website! If you came to Dublin to learn about Dublin, then The Little Museum is for you. Since the artifacts have been donated by the people of the city over the centuries, there are lots of unique stories. This makes it a truly fantastic way to learn about the history of the city. You can learn about topics like Dublin history, films, music, politics, and culture in a very condensed setting – but don’t let its size deter you, there are still lots of interesting things! We’ve never been but we have heard great things about the museum. If you have time, go check it out but since the museum has limited capacity they recommend booking tickets ahead of time. You can join one of their popular guided tours with an admission ticket which you can learn more about here! Now, of course this is not a thing you can do in Dublin but it is certainly a thing you can do FROM Dublin! Taking a day trip to explore the surrounding areas is a great idea if you’ve only got a few days and want to maximize your experience! Now, we’re actually writing a whole post on just day trips from Dublin so check back soon if you’re eager to read! For now, we’ll just mention a few of the most popular so you can go and have a look for yourself, your interests, and your timelines! 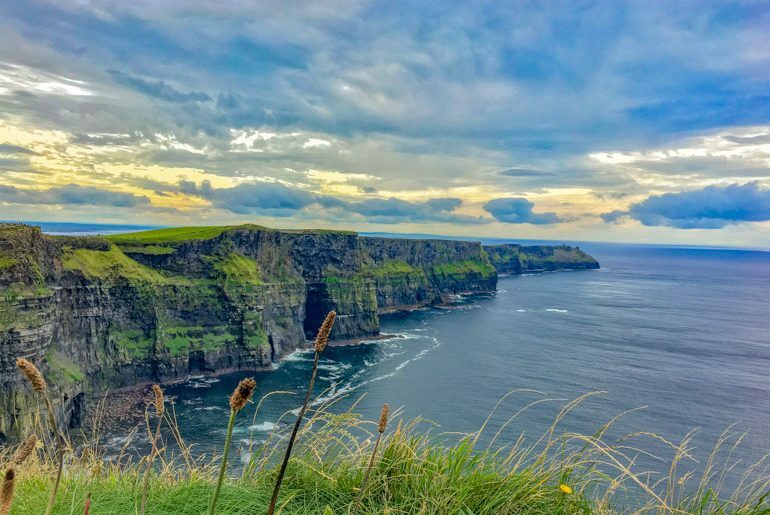 If you wanted to check out the famous Cliffs of Moher, you can book a Cliffs of Moher day tour from Dublin to make it easy on yourself! If you wanted to head to Northern Ireland and explore the capital – Belfast – as well as the world-renowned Titanic Experience Museum, you can hop on a day trip to Belfast! We have friends that did a tour up there a few months ago and they absolutely LOVED the Titanic Experience and exploring Belfast! Finally, you might even feel inspired to take a day trip to the Giant’s Causeway from Dublin to head to the famous rock formations. If you’re a Game of Thrones Fan, we don’t have to tell you that this tour includes some of the filming sets. You can also learn about the hit TV show while exploring the Irish countryside! And there you have it – a few great things to do in Dublin! What do you think? Think you can do them all in a few days spent in the city? Eric has always had a great time in the city and can’t wait to go back to show Lisa and explore the things he hasn’t yet done! We hope that you’ve learned that there’s plenty more to Dublin than drinking and partying – with a rich history and culture everywhere you look. If you go to Dublin, get in touch and let us know what you loved to do! 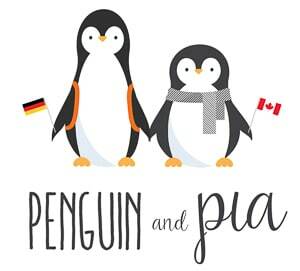 We’d love to hear about your trip!